At the invitation of Anton Vaino, Chief of Staff of the Presidential Executive Office of the Russian Federation, Li Zhanshu, member of the Political Bureau of the CPC Central Committee, member of its Secretariat, Director of its General Office will visit Russia from April 25 to 27. Director of the General Office of the CPC Central Committee and Chief of Staff of the Presidential Executive Office of the Russian Federation established the consultation mechanism in 2014 and exchange visits annually. During his visit to Russia, Director Li Zhanshu will meet with Russian leadership and have in-depth exchanges and communication with Chief of Staff Vaino on ensuring contacts between the two heads of state and better implementing the consensus reached between the two heads of state to deepen bilateral cooperation. We believe that Director Li Zhanshu's visit to Russia will further consolidate mutual trust, facilitate exchanges between the two leaders, and inject new vigor to the high-level performance of China-Russia Comprehensive Strategic Partnership for Coordination. Q: In a written answer approved at a Japanese Cabinet meeting on April 14 in response to questions raised by a lawmaker from the opposition Democratic Progressive Party, the Japanese government said that the beneficial and appropriate contents of Adolf Hitler's autobiography "Mein Kampf" ("My Struggle") could be used in a way that adheres to the spirit of the basic education law, among other conditions. What is your comment? A: The world knows perfectly well what kind of a book "Mein Kampf" is. The Japanese government agreed that some contents of such a book could be used in the textbooks for teenage students. No wonder that it has caused great concern among people inside Japan. Fascism and militarism, as the root causes of the WWII, must be exposed, criticized and eradicated once for all. On historical issues that concern the principle of right and wrong, there is no room for the slightest ambiguity and obscurity. We urge the Japanese side to deeply reflect upon and learn from historical lessons, educate its young people with the right view of history, unequivocally guard against and oppose poisonous thoughts of war, and win trust from its Asian neighbors and the international community with concrete actions. Q: Pictures of the military parade of the DPRK from the ROK showed there were possibly Chinese trucks used to carry missiles. What is China's comment? A: We have repeatedly said from this podium that China and the DPRK, as two neighbors, maintain normal contacts, including normal business ties. Meanwhile, China, as a member of the UN and a permanent member of the Security Council, has been strictly fulfilling its international obligations, including those from the Security Council resolutions. 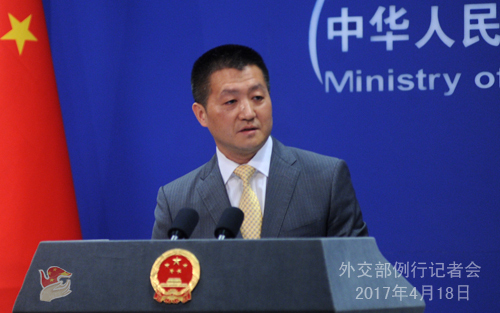 All relevant parties must be clear that a sharp line needs to be drawn between the obligations authorized by the Security Council and all other unilateral sanctions that China in principle opposes. Q: April 25 is the foundation day of the Korean People's Army of the DPRK. Will China send any delegation to the occasion? A: China and the DPRK maintain traditional friendly exchanges. As for specific arrangements, we will timely release relevant information. Q: The American Chamber of Commerce just released its yearly report which encouraged the US government to try and create fair trade with China. What is China's comment? A: I can say something in principle. But for any specific policies or details, I would refer you to competent authorities. Regarding the investment environment, according to the Chinese Ministry of Commerce, the actual investment from the US to China last year registered a 52.6% year-on-year increase. As a developing country, China has achieved remarkable progress in the speed and scale of opening up its market. China, already one of the developing economies with the greatest level of openness, remains committed to further opening up. We welcome foreign investment and will continue to offer more investment opportunities for foreign-invested enterprises. The Notice on Several Measures on Increasing of Openness to Foreign Investment and Active Use of Foreign Investment published by the State Council of China on January 17 of this year, in case you missed it, also testifies to China's determination and sincerity when it comes to further increasing openness, creating a fair and level playing field, and improving its traction for foreign investment. Meanwhile, we hope that other countries could open their doors for the Chinese investors as well so that investment and trade cooperation can develop soundly in an environment featuring greater fairness, transparency and openness. Q: About the Chinese trucks in the DPRK's military parade, is the Chinese government worried that there could be dual-use technology which is being exported from China? The Chinese company might think it is for civilian use and yet is used for another. What is your comment? A: As I said, China, as a member of the UN, has been strictly fulfilling its international obligations, including those from the UN Security Council resolutions. Meanwhile, we maintain normal economic and trade contacts with other countries, including the DPRK. As for the issue of dual-use items, first, the Security Council resolutions have clear stipulations on what dual-use items are under control and what are embargoed. As long as they are embargoed by the UN security Council resolutions, China observes relevant provisions strictly. As for China's export control policies, with our non-proliferation export control policies getting full-fledged, we now have a list-based policy regime, on which you can rest assured. Q: First, it is reported that the ROK is yet to be invited by China to participate in the Belt and Road Forum for International Cooperation (BRF). Some say it is because the ROK will have its presidential election on May 9, five days before the opening of the BRF, therefore decision cannot be made on the attendees. If the ROK decides to participate in the BRF in the 5-day period, is that doable technologically speaking? Second, will the DPRK send any senior officials to the BRF? A: I will take your second question first. This morning, Foreign Minister Wang Yi announced the foreign heads of state and government that will take part in the BRF to be held from May 14 to 15 at the invitation of President Xi Jinping. 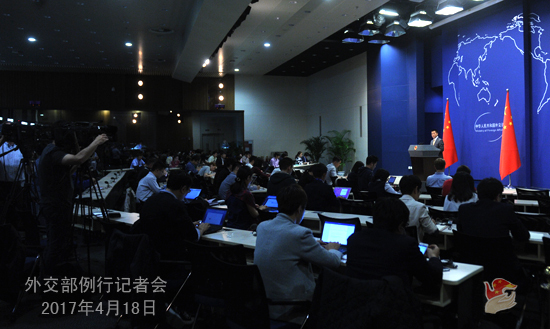 Returning to your first question, half of which was actually answered by your own descriptions, Foreign Minister Wang Yi talked about the considerations behind the invitations and the final name-list which can be found on the Foreign Ministry's website. As for your hypothetical "if", you know we never answer that here. 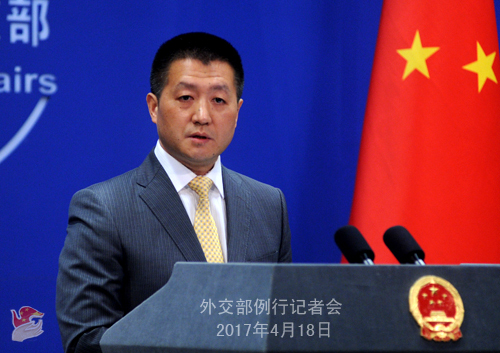 Q: The Chinese government has been speaking a lot on a regular basis on the DPRK. Can you give us an update as to whether the situation is easing or getting tense? A: Just like you, we want the tension on the Korean Peninsula to ease as soon as possible, the situation to cool down, and all relevant parties to return to the negotiating table at an early date and especially create an atmosphere conducive to properly resolving the Peninsula nuclear issue through dialogue and consultation. This is a goal China has been endeavoring to achieve for so long and an original motivation behind China's suspension-for-suspension proposal raised not too long ago. However, China did not cause this issue. We are not where the trouble lies, nor are we the most important player. As a close neighbor, we have our security concerns and interests to think of and we have made due efforts for the resolution of this issue. We truly hope that all relevant parties could work in the same direction and jointly make such efforts.